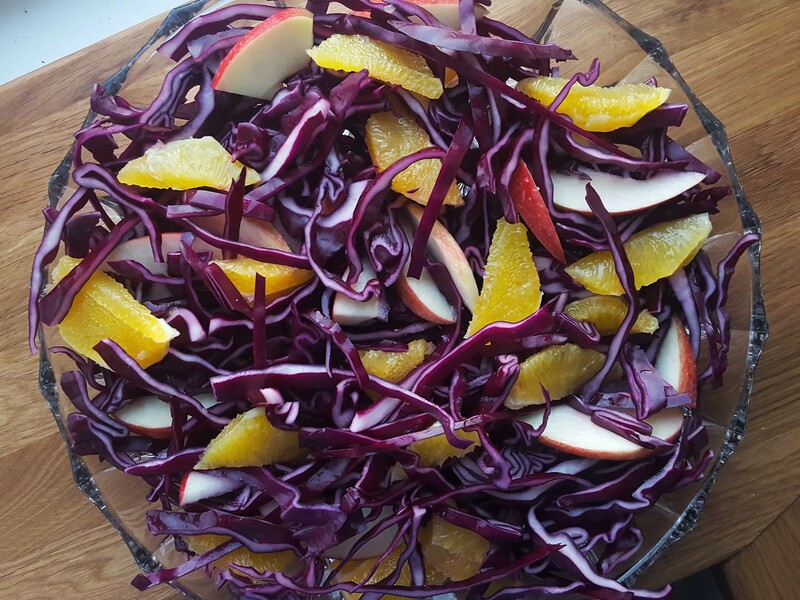 This recipe for a red cabbage salad topped with slices of oranges and apples is one of my favorite salads during the fall. 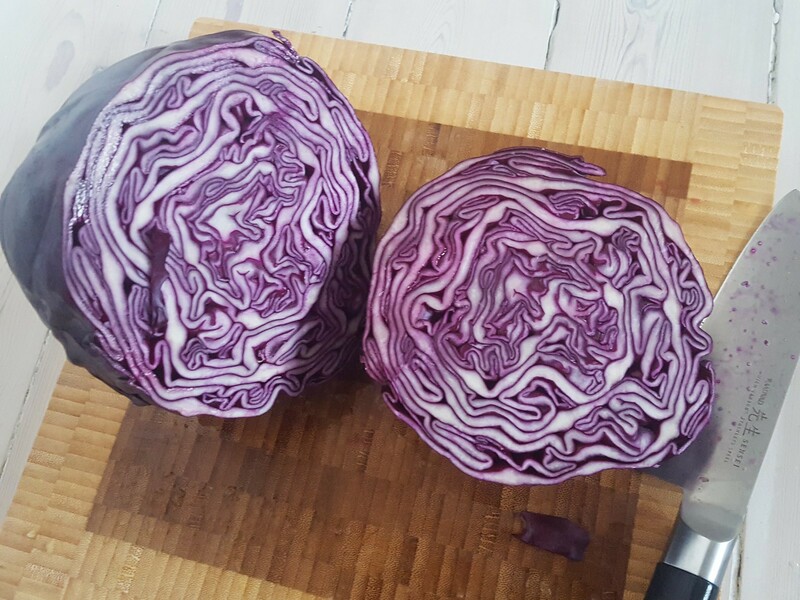 During the fall and winter months, I can buy fresh red cabbage for almost nothing in Denmark. The climate in Denmark is perfect for red cabbage production, which is way it is such a popular and very cheap vegetable in Denmark. I am sure this applies to many other countries around the world. Especially, most European countries and the northern states in the US. I personally love this salad – it is super simple to prepare, it has a great and fresh taste and it is at the same time very healthy. Red cabbage is a great source of good vitamins and it is very filling meaning that eating this salad will make you eat less of other and maybe more unhealthy food. I typically serve this with some good pork or beef meat. However, it is also perfect together with a grilled chicken breast or maybe some fish. 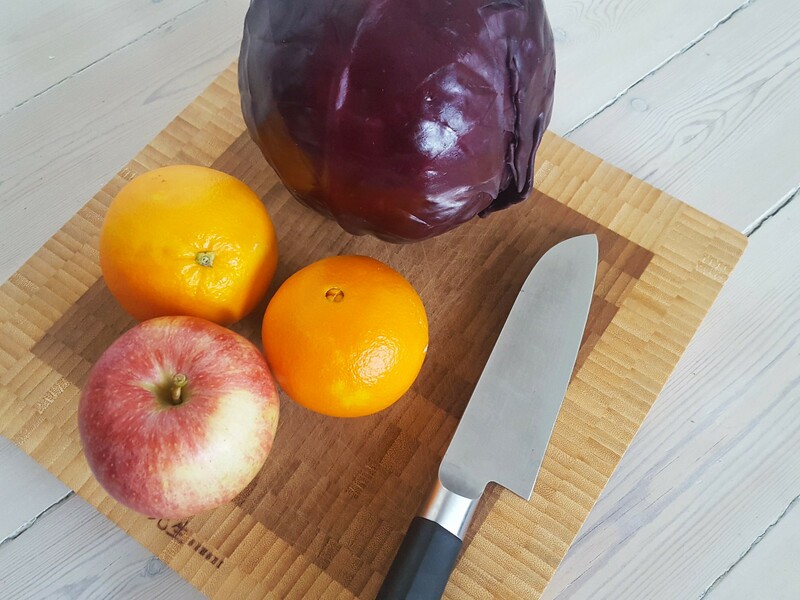 I can recommend you to try some Danish Meatballs or an interval roasted pork tenderloin, both very delicious and perfect together with this red cabbage, orange and apple salad. As said, this salad is very easy to make. You simply start by removing and throwing out the first couple of leaves of the red cabbage. Then you take a sharp knife and cut the cabbage into very fine pieces – fine pieces is how most people prefer this salad. I normally prefer a more ‘coarse’ salad. However, this is of course up to yourself. When you have shredded the red cabbage, then peel some oranges and apples and slice them. Mix the three ingredients in a nice salad bowl or plate and it is ready to be served. 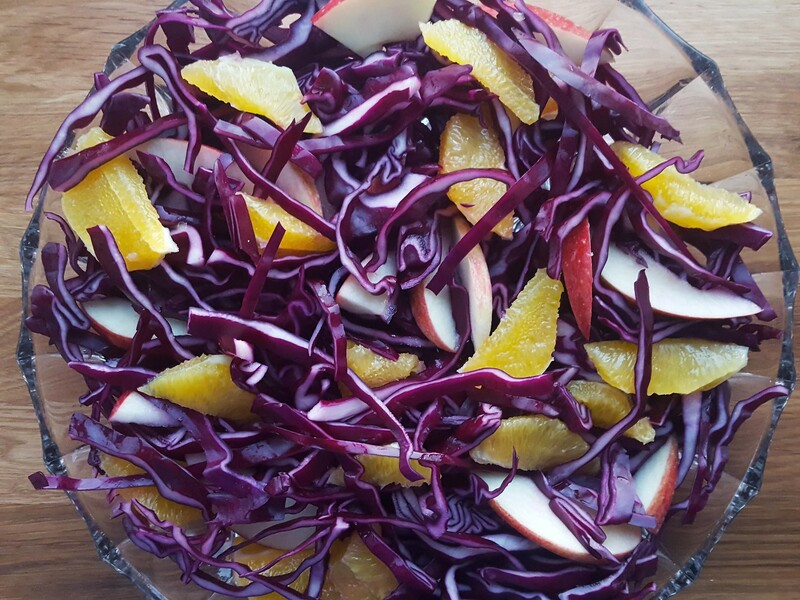 You can also add salt, pepper, olive oil and apple vinegar to taste – However, I normally just serve this salad with the three main ingredients; red cabbage, oranges and apples. If you like this red cabbage salad I can also highly recommend trying my other red cabbage salad which has been really popular here on my blog as well as on my social media channels. 1. 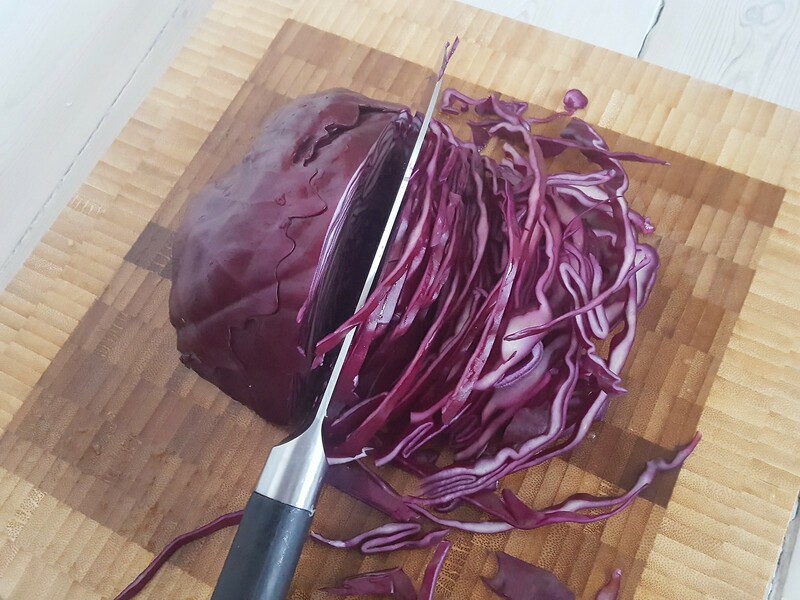 Start by shredding the red cabbage into fine pieces. 2. 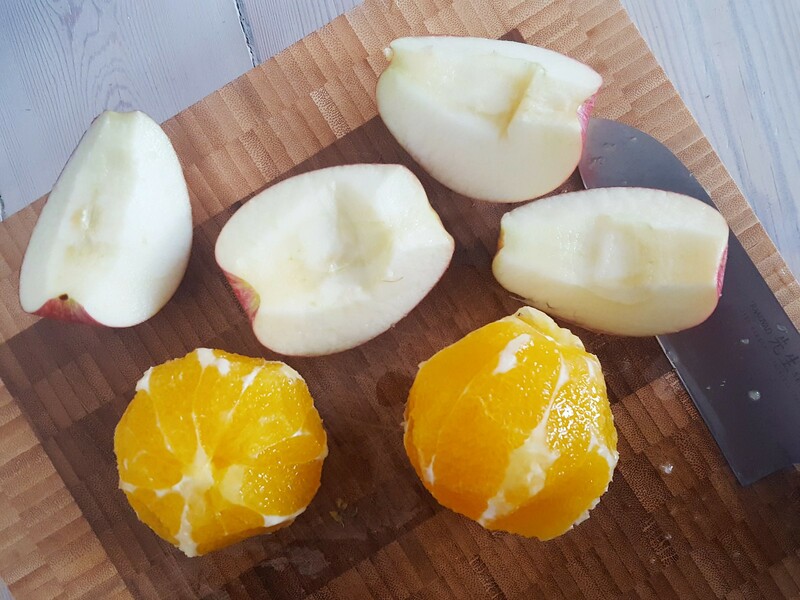 Peel the oranges and the apples and cut them into smaller wedges. 3. 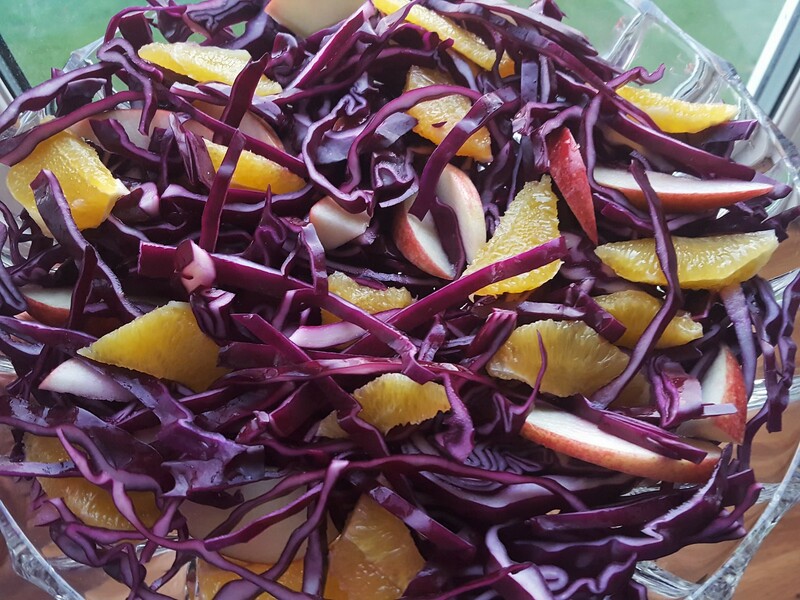 In a nice salad bowl or plate; mix the red cabbage, apples and oranges. 4. Add a little salt and pepper to taste. You can also leave out this step if you normally do not prefer salt and pepper in your salads. 5. You can also add a little olive oil and apple vinegar. Again, you can skip this step if you prefer.